The XSEED School of Tomorrow Conference was held on August 05, 2017 (2:00 pm to 6:00 pm) at Shangri-La Hotel, Bangalore, India. The theme of the conference is ‘No Quality, No Business’. School of Tomorrow is one of Asia’s largest and most respected school conferences. Over two hundred leaders from education and other domains will be attending. In the past, leading thinkers and doers like Howard Gardner, Peter Senge, Tony Wagner, James Tooley, Andy Homden, and Daniel Goleman have addressed the conference. Now in its 9th year, the conference has been attended by over 10,000 school leaders and educators. Charles Fadel is a global education thought leader and author, futurist and inventor. He is a visiting scholar at the Harvard Graduate School of Education and MIT. He is a co-author of the best-selling “21st Century Skills” and “Four Dimensional Education”. He was formerly the Global Education Lead at Cisco Systems. He holds seven patents in high technology. Vinita Bali is a one of India’s most successful business leaders and well known child nutrition advocate. She was the Managing Director of Britannia. Forbes named her on its list of “Asia’s 50 Power Businesswomen”. Vinita is Chair of the Board of the Directors of the Global Alliance for Improved Nutrition. Ashish quit his international corporate career in Paris to pursue his passion in education and founded XSEED. He personally led the creation of the program from scratch, and continues to be deeply involved in the R&D and learning-teaching aspects. He has an Ed.M from Harvard Graduate School of Education, MBA from XLRI, and previously worked at P&G and Danone. Ashish chairs the XSEED board and is focused on innovation, global expansion, and partnerships. When he can he runs, teaches grade 4 science, and treks in the Himalayas. Praveen Sood is one of India’s leading administrators and a well-known innovator in public service delivery. Praveen is the Commissioner of Police for Bangalore City where he has used technology, commu and social media to make the city more secure. Praveen is a graduate of IIT-Kanpur, IIM-Ahmedabad and Syracuse university. Priya Krishnan is a leading education entrepreneur and early childhood education advocate. She is the CEO of KLAY Schools, India’s leading chain of preschool and day care centers. A graduate of the London Business School, Priya left a successful corporate career in IT-Outsourcing to pursue her entrepreneurial aspirations. Dr. Rajat Chauhan is an well known physician, ultra-marathon runner and a physical fitness advocate for children and adults. He is the author of “Pain Handbook” and has written several columns in “Mint” and “Forbes” Magazine. 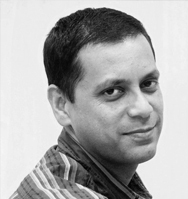 Samar Halarnkar is editor of IndiaSpend, Nieman Fellow at Harvard, public interest journalist and author. Registration for School Of Tomorrow is now closed now.